Tulum is a Maya archaeological site on Mexico's Riviera Maya, adjacent to the town of the same name. The most spectacular aspect of Tulum is its location on a cliff overlooking the brilliant turquoise water of the Caribbean. The ruins themselves are not as impressive as those you will find at other Mayan archaeological sites, such as Chichen Itza and Uxmal, but it is still an interesting site, and well worth a visit. The name Tulum (pronounced "too-LOOM") means wall, referring to the fact that Tulum was a walled city, protected on one side by steep cliffs facing the sea and on the other by a wall of about 12 feet in height. Tulum served as a trading port. 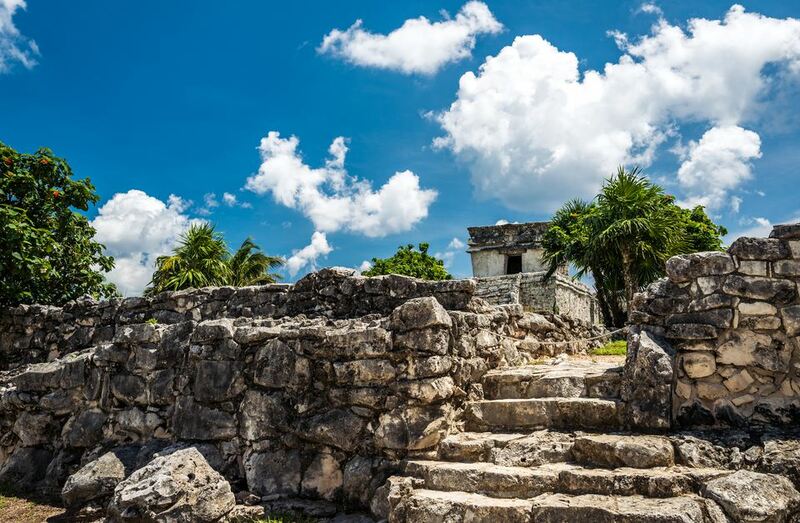 The buildings that are visible on the site date from the Post-Classic period, around 1200 to 1500 AD and the city of Tulum was functioning at the time of the arrival of the Spaniards. The interior of this building has original Mayan frescoes, in blue-green and outlined in black, depicting Mayan gods and religious motifs. This is the tallest building of the archaeological site. It may have functioned as a navigational aid, directing Mayan craft through the break in the reef to the beach. The beach at the Tulum ruins definitely merits a mention, because it's one of the most beautiful beaches along the Mayan Riviera, and perfect for taking a swim after visiting the ruins. Read more about the beach at Tulum. The Tulum ruins are located 81 miles (130 km) south of Cancun. The town of Tulum is located about two and a half miles south of the ruins. There are many options for accommodation here, from luxury boutique hotels to rustic cabanas. Tulum can easily be visited as a day trip from Cancun. Many people visit the Tulum ruins as part of a tour that also takes them to Xel-Ha Park. This is a good option, but if you would like to get the most out of your visit to the ruins, you should visit them earlier in the day, before the tour buses arrive. The parking lot is located at a distance of 1 km (about half a mile) from the archeological site. There is a tram that you can take to the ruins from the parking lot for a small fee. The Tulum Archaeological Zone is open to the public daily from 8 am to 5 pm. Admission is 65 pesos for adults, free for children under 13. If you would like to use a video camera inside the site there is an extra charge. There are local tour guides available on site to give you a tour of the ruins. Only hire officially licensed tour guides - they wear an identification issued by the Mexican Secretary of Tourism. The Tulum ruins are some of the most visited archaeological sites in Mexico. Since it is a relatively small site, it can get very crowded. Your best bet is to arrive as early as possible. Since the site is small, a couple of hours is sufficient to tour it. Bring along a bathing suit for a refreshing swim at the Tulum beach after visiting the ruins, and of course, don't forget sunscreen and water to drink.